peek >> << backI Street east of 3rd, November 2004. Six-block portion of the Capper/Carrollsburg redevelopment; construction completed in 2012. 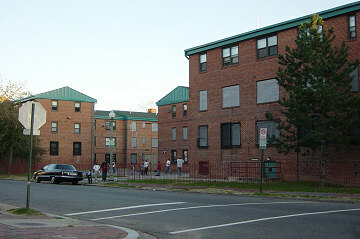 138 market-rate townhouses, 76 workforce-rate units, 13 Section 8 ownership units and 86 subsidized rental units. Lofts at Capitol Quarter Expanded Photo Archive. February 28, 2016 - The same location, now a row of townhouses, with owners moved in. Construction began here in spring 2008; however, problems were uncovered with the foundations on the original units, and in October 2008 it was decided to demolish the first frames and foundations and start again. Two months later, new framing began, and the first residents moved in in April 2009. June 16, 2018 - The same location, completed. April 27, 2009 - The same spot, now looking slightly different. March 24, 2019 - The same location. August 26, 2009 - The same location, completed. June 16, 2018 - The same location, with the construction massing strangely echoing the old building. September 30, 2018 - The same location, where townhouses sprung up in fall 2009, with the church no longer looking quite so alone. March 23, 2019 - The same location, completed. This is the final block of Phase 1. May 1, 2010 - The same location, with construction underway. Compare the existing homes with the "before" photo to see how many have been renovated. March 23, 2019 - The same location, with construction all but finished. April 26, 2015 - The same location, where construction began in fall 2009. This is the final block in Phase 1. October 5, 2014 - The same location, with the north side of the block finished as part of Phase I, and the south side now complete as the first part of Phase 2. Three views of the southwest corner of 4th and I streets; (top left) in April 2006, having been vacant more than a year; (top right) in March 24, 2019, with construction complete; and (bottom left) the EYA model that showed what this spot would look like. July 31, 2011 - The same location. July 11, 2018 - The same location, after. June 10, 2012 - The same location, bisected by the new street known as 3rd Place. October 5, 2015 - After. April 26, 2015 - The same location. April 26, 2015 - The same location. In addition to Capitol Hill Tower, you can also now see 909 New Jersey in the distance. June 16, 2018 - The same location, which was cleared in 2006 and was home to the original Capitol Quarter sales center; the trailer was removed in June 2011. September 9, 2012 - The same location. March 24, 2019 - The same location, after. Note the additional disappearance of the old brick townhome next to 300 M; this house had been bought by the DC Housing Authority in 2005. June 16, 2018 - The same location, all done, marking the completion of Capitol Quarter. 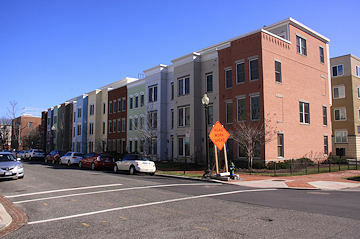 In June 2009, Capitol Quarter moved its sales center from a temporary trailer to one of the newly completed townhouses on Fourth Street, with the sales center and the house next door also being model homes. The lobby of the sales center. The huge scale model of the entire Capitol Quarter development (scroll down for close-ups). The "finishes" section of the sales center is on the third floor. The living room and dining room in the Banneker II model. The kitchen in the Banneker model. The dining room and kitchen in the Addison II model. The Addison's living room, as seen from the dining room. The Addison designs come with an optional loft level and roof deck. The reverse view of the loft level. A closer view of the roof deck. Looking along the row of roof decks along Fourth Street, looking northwest. The Capitol dome, pretty much invisible in this shot (it's just to the right of the dormer), is much more prominent in person, although a Garfield Park tree prevents the view from being pristine. Looking to the southwest from the rook decf, with the old Sales Center down below.